One of my major exercise issues is going from the joy of open water swimming to indoor pools. No waves, or fish to get my attention, it gets a bit monotonous. And, sharing lanes with other people, some with good manners, some not so much, is another issue. Probably the most annoying aspect of indoor swimming pools is dealing with chlorinated water. So with a bit of digging around, I discovered a sweet, low cost way to remove this strong chemical from the skin. Vitamin C to the rescue! A West Coast Naturopath, Dr.Deborah McKay wrote up a simple solution I would like to share. Simply add a half teaspoon of crystallized Vitamin C to a pint of water in a spray bottle, apply after swimming, rub it in, and rinse off. 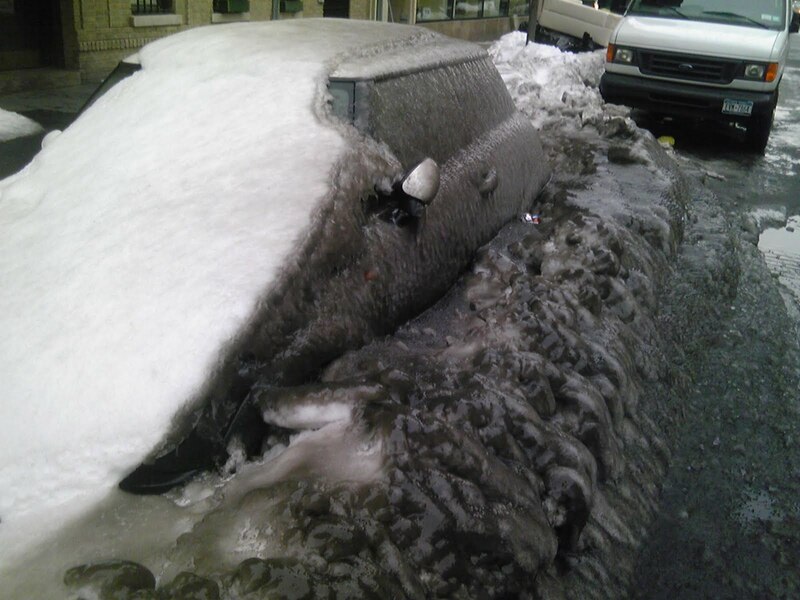 I was walking in the West Village last weekend, when the sight of this ice encrusted car caught my attention. I had to take the photograph you see above. As you can see the vehicle in the background is free and clear. The past weeks of snow, freezing rain, partial thaw then re-freezing created this miserable condition. Yet it is the result of doing nothing that made the difference between the two vehicles. I constantly urge my patients to keep the small problems small. Stay of aware of your body, and take action early. Get the exercise, the massage, of course see me; before you have to take drastic action and see a surgeon! The owner of the car may have to wait for the Spring thaw, the owner of our bodies (that’s us) don’t get that luxury. Living in the information age, what tools do we have to assess ourselves? Tests should be simple, inexpensive, and accurate. Equally important, they must point to solutions that allow us to determine choices. -What small changes will greatly improve your condition (ex: quit smoking)? -What large change will be worthwhile (ex: you may really need a surgery)? I am currently reviewing several symptom survey forms that “cast a broad net” over a great variety of health issues. Late last year HFA published a study from the Mayo Clinic showing how flu shots in children actually increased the likelihood of hospitalization. Now a new study is stating that flu shots in the elderly mostly likely have no health benefits at all. There is no evidence to support the contention that the influenza vaccine administered to the over 65s is of any more use than opening the windows and washing hands, a new study from the Cochrane Collaboration claims. “Our analysis is compiled using millions of data from 40 seasons worldwide. What we have seen is that the influenza vaccine can at best have a very small effect,” said Thomas Jefferson, one of the authors of the report. 1. Unnamed US Navy vessel put to sea in April with 347 man crew. 2. Entire crew was vaccinated with H1N1 Swine Flu vaccine shortly after they put to sea. 3. Crew sickened so severely that other ships had to respond to render aid. 16 Medical Dr.s put aboard from an unnamed aircraft carrier and other responding vessels. Total of 50 Navy personnel sent aboard to respond to crisis. 4. Two of the crew of 347 died – including the Captain of the ship (a Lieutenant Commander) and a Chief Petty Officer. 5. 50 personnel sent aboard to help are quarantined in Navy hospital in Balboa, Spain after 10 of them caught the flu from the ship’s crew. Two of the 50 quarantined are in serious condition at last report. 6. Of the 347 man crew that were vaccinated, 333 contracted the H1N1 flu FROM THE VACCINE. Two died, as mentioned above, and 331 survived. Only 14 of the 347 vaccinated sailors did not show any ill effects from the vaccine. 7. Navy has threatened all the spouses of the ship’s crew to remain silent – claiming all this information is classified. Some are whistle-blowing and that is where this information is coming from. 8. On the unnamed aircraft carrier that provided assistance, 415 sailors contracted the swine flu and are currently quarantined onboard. PLEASE pass this email along. The truth is that the swine flu epidemic will be created BY THE VACCINE. If we don’t take it, there will be no epidemic. >From this one test it’s apparent that the vaccine as tested on that ship’s crew in April is 96% effective at infecting the recipient with swine flu. Such an infection rate is impossible to achieve by any natural means. Though it only killed 1% immediately, there is no telling what the long term effects on those injected with the vaccine will be. See the research on the long term effects of the 1976 swine flu vaccine, and the Gulf War anthrax vaccine programs for more information. Also note that mere contact with those that have been vaccinated creates a 20% chance of you contracting the swine flu even if you have not been vaccinated. Please pass this data along to anyone you care about!